If you're on instagram, you'll probably have come across the brand Your Tea before. They make a series of different teas with various health benefits - Tiny Tea helps with things like bloating, indigestion and claims to encourage weight loss, so it's certainly something I've been tempted to try! Your Tea have now turned their tea making skills to skincare, and have brought out a face mask called Tea Face which is made from - you guessed it - tea! I have lots of great new products from Models Own to share with you today. There are 10 new shades for spring in the super shiny hypergel range, and Models Own have added a new product to their uber successful nail line - Colour Chrome body tattoos! Makeup Revolution have brought out six new shades in their Blushing Hearts range with three new blush shades, a new bronzer and two new high-lighters. At £4.99 each you get a huge amount of product, and the packaging's super cute, so they look lovely on my dressing table! I have three of the new shades to show you, which are the hot summer of love triple baked bronzer, peachy pink kisses triple baked blusher and goddess of faith triple baked highlighter. In a concerted effort to improve the texture and appearance of my skin this year, I've become pretty much obsessed with skincare. We're only into February and my morning and evening skincare routines have already evolved several times, not to mention having vastly grown in terms of the number of steps and time involved. But I'm starting to see some improvements, and that's what matters! In honour of my new skincare addiction, I was excited to go along and hear about a fairly new skincare brand to the UK which mixes the experience and expertise of both French and Korean skincare. It's called Erborian (which translates to 'herbs of the Orient') and it's part of the L'Occitane group. Although some of its product have already been available in the UK for a while, I'd not heard of the brand before, but they're launching tonnes of new products to their UK line at the moment, including some really unique gems that I can't wait to get my hands on. If you stop by my blog often, you'll have definitely seen me raving about Glamglow's Youthmud in the past - it's my all time favourite face mask and I'm never without a jar in my bathroom. Recently Glamglow added a new mud mask to their line up, making four altogether (the one I don't have here is supermud). The newest mask, in bright, shiny green packaging is called Powermud and it promises to give the skin an intense cleanse. MUA have a series of new collections for spring and they couldn't have come at a better time. I think February's that turning point where you've definitely had enough of winter - Christmas is forgotten and we're longing for those lighter nights and sunny days! The MUA Luxe Whipped Velvet lips certainly have me in the spring mood with five pretty, soft shades and a lovely light texture. Get-on-my-face. There's no doubt that Makeup Revolution have completely changed the affordable makeup landscape recently. Their range is massive, and they have a cheaper alternative for just about every product you might want. You'll notice when you wander around their site that a lot of the makeup looks familiar and is often 'inspired' by a high end product. But their latest palette, the Iconic Pro, is an out and out copy of the Lorac Pro palette right down to every last shade and even the slightly rubbery matte packaging, and I'm not sure how I feel about that. Three easy valentine's day treat recipes - strawberry smoothie-frappes, parfaits and giant cake pops! I've been so excited to share this blog post with you, and just a couple of days until Valentine's day seems just about the right time if you're planning to do any making and baking. As you know, I love a theme to play with, and Valentine's is just perfect because there's so much scope to do just about anything as long as it's red, pink or heart shaped! I've probably never put so much time and effort into just the one blog post, but it's been so enjoyable, and I hope you like it! I love Lush at any time of year, but when they bring out their themed products for occasions like Christmas and Halloween they're really at their best. Of course with Valentine's day just around the corner I had to take a trip to Lush to look at their latest limited editions, and this is what I came home with. 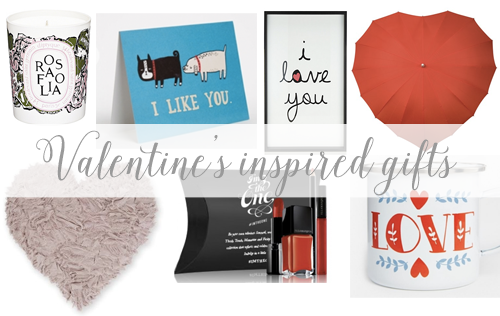 Whether I'm celebrating valentine's day with presents of not, I still love a good browse of the love inspired and heart shaped products hitting the shops in February. I was going to do a post on valentine's inspired makeup collections, but I haven't seen so many brands doing that this year - I guess it can be a bit overdone as they're kind of the same every year! Instead, and for those of us who are unlikely to be showered with diamond rings and Carribean cruises this Valentine's, I've put together a collection of some of my favourite love inspired bits and pieces. Following on from my first Kiehl's experience, I've been trying out two of their skincare treats for the past month and a bit. I'm really trying to take better care of my skin this year and am already seeing the improvements that investing more time and effort into a solid skincare routine can bring. Skincare's something which I didn't have to think much about five years ago (although I still should have and I regret not taking more preemptive measures..), but now the wrinkles are starting to creep on in, it's at the very top of my beauty agenda. A few years ago I had a ghd air hairdryer when they first came out, and I'd actually forgotten just how amazing it was until I had the chance to try one again, and this time it's in a beautiful rose gold finish! The ghd air has got to be the most powerful dryer I've had - it dries my hair incredibly quickly but leaves it sleek and shiny without a tonne of effort. New shampoos from Aussie? Nope - the much loved hair brand has branched out to bring us a new range of body washes, and considering how darn good their shampoos and conditioners smell, these new shower gels are bound to be a big hit.